In 1881, the British government sanctioned the formation of several new infantry regiments in Ireland and, in an effort to raise the profile of the armed forces as a whole, allowed the new units to fashion close ties with their local areas. Renmore Barracks in Galway was identified as the home depot of a new regiment, which amalgamated the 88th and 94 regiments of foot, and was known as the Connaught Rangers. The regiment developed a reputation for both ferocity and unruliness; it was uncharitably nicknamed ‘The Connaught Footpads’ and officers serving with the regiment in India during the 1880s remarked that ‘drink was the besetting sin of the Connaught men.’ Galway was a potentially fertile recruiting ground for the British forces, as the area was poor with relatively high levels of unemployment and underdevelopment; the county as a whole was taken into the Congested Districts Board in 1909. The Rangers drew in recruits from across all areas of the province, and one of the most notable images of this is Listed for the Connaught Rangers, painted by Lady Elizabeth Butler, which depicts a recruiting sergeant escorting recruits to the depot against the backdrop of a ruggedly western landscape. Like other Irish regiments, the Connaught Rangers fought in South Africa in the Boer War and took particularly heavy casualties during the battle of Colenso. The various battalions of the Rangers were also involved on multiple fronts throughout the First World War. 2nd Battalion was part of the British Expeditionary Force sent to the continent and took part in most of the major engagements on the western front: Messines, Neuve Chappelle, Ypres and Loos, while 6th Battalion saw action at the Somme and Passchendaele. 5th Battalion was part of the ill-fated Gallipoli campaign in 1915, the abortive attempt to force Turkey out of the war, and suffered heavy casualties: one Ranger recalled that the positions were ‘chock full of Irish and Turkish dead’. Subsequently, the battalion was transferred to the Balkan front in December 1915 to face the Bulgarian army, which had just joined the conflict on the side of the Central Powers. Other battalions also saw action in Palestine, against the Turkish forces, and in what is now Iraq. According to the Connaught Rangers Association, almost 13, 500 members of the Rangers served overseas during the First World War, with approximately 2500 of them being killed. Of these, it has been estimated that around 280 were from Galway itself. They are commemorated with memorials both in St Nicholas’ Church and Galway cathedral. Despite its association with Galway, the regiment played no part in the suppression of the Rising in the county during 1916. Most of its active battalions were serving abroad at the time, and those that remained in Ireland were scattered around the island between Cork and Dublin. Manpower was more important than maintaining ties with localities, and during the war the Rangers established service battalions in both Leinster and Munster and was far more concerned with training and dispatching men to their sister units overseas, rather than tackling the Volunteers. Apart from their deeds in battle, the Rangers are most famous for the events of June – July 1920 when elements of the regiment mutinied. A mixture of dissatisfaction with their conditions and unsettling news from Ireland resulted in many Rangers refusing to follow orders, wearing Sinn Fein badges and flying Irish flags. An exchange of fire between the mutineers and other soldiers resulted in the death of two Rangers, and the mutiny was swiftly suppressed. A total of 61 Rangers were convicted of partaking in the disturbances, with 14 being sentenced to death; but only one, Private James Daly, was actually executed, shot in November 1920. The rest were given long prison sentences. Ironically, the mutiny illustrated the tenuous connection between Galway and the regiment: the mutiny occurred in India and Daly, identified as the ringleader, was originally from the village of Tyrellspass in Westmeath. The remaining mutineers were released in 1923, on the request of the Free State government, and their story became incorporated into the revolutionary narrative; they were awarded pensions by the Fianna Fáil government in 1936 and a monument was erected at Glasnevin – not Galway – in 1949. 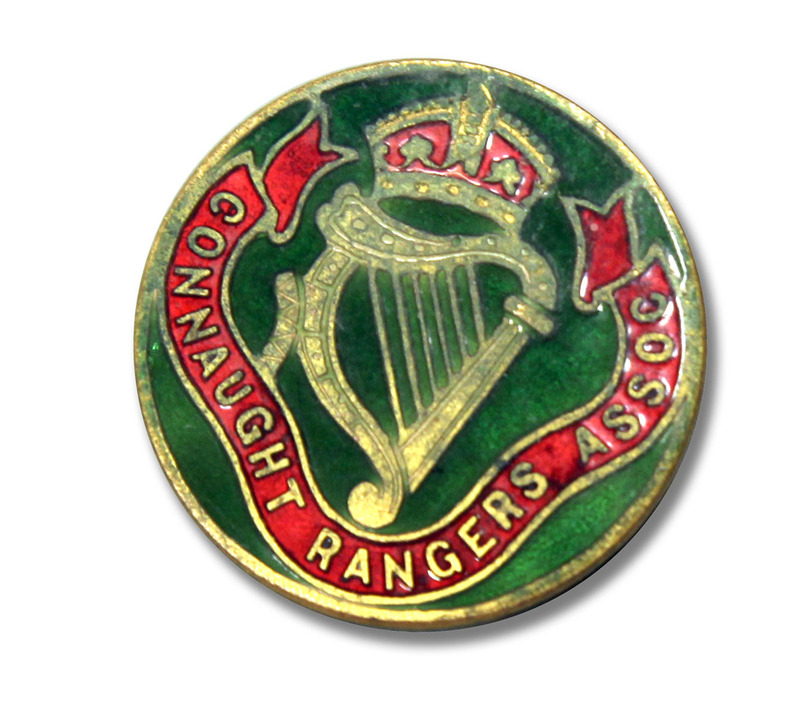 The story of the Connaught Rangers ended in 1922 when, along with the other Irish regiments – the Royal Irish Regiment, the Leinster Regiment, the Royal Munster Fusiliers and the Royal Dublin Fusiliers – they were disbanded as part of the Anglo-Irish Treaty settlement. However, elements of their legacy live on in Galway right up to the present. Firstly, Renmore Barracks is still in use, by the Irish army, although it was renamed Dún Uí Mhaoilíosa in 1954. Secondly, the Rangers practice of recruiting in areas, such as Connemara, where Irish was the spoken language was maintained by the creation of An Cead Cath, the 1st Battalion of the Irish army, which is an Irish-speaking battalion. Mallinson, The Making of the British Army, p. 401. Connacht Tribune, 20 May 2005.